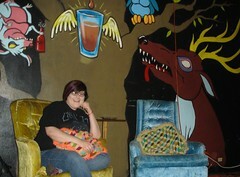 Shreveport's most colorful, most communal and art-filled, alt-rock bar is managed by Jen Wasson, an English major who loves books and film. Under a gigantic Joe's Bar & Grill sign on King's Highway across from Centenary College lies her funk palace. Once called Lil Joes, it is now the Jackrabbit Lounge. "It used to be a black-walled shi*hole with t-shirts on the walls," says Frank Jones, staff member and musician. The Jackrabbit Lounge was recreated in the image of David Nelson's Zebra Room by a group of young artists who were inspired by downtowner Nelson, an architect, artist and producer of art and music shows. A cast of tens helped Wasson re-paint and re-upholster the room. "It was Ali Dickson's concept," said Brittney Maddox. "Sizer Yerger painted an entire wall," said Wasson. "The Peekers repainted the stage and installed the astroturf and put the flowers around the speakers," said Michael Stevens. "It's art from people who frequent the bar," added Jones. Contributors include "Sherry Teer, Lance, Pearl, Aubrey Ballard, John Mackie, Carter Sutton, Meredith Mighell, Frank Jones, Christy Herren, Bryan Sullivan. And Jordan West. John Martin and Levette Fuller." "Almost everyone did a chair," said Wasson. It is also furnished with Jen's furniture and thrift store finds. "When I see cool glasses, an ashtray or tip jar, I buy it," said Jones. "Bands who come through here" - and they come from NYC, San Francisco, Austin, etc - "are so happy to find this place. They take pictures around the stage, or the jackrabbit or the horses, and put it on their myspace," added Maddox. Fri, Nov 2, a show of Dia de los Muertos art curated by Conchita McElwee will peer from the walls. Says her flyer, "Art at 8 pm. 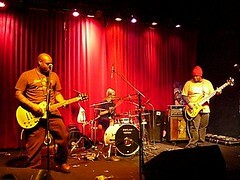 Music at 10 pm: Zack the Rookie, Power Pellut, and, from Brooklyn, White Rabbit." See the Jackrabbit myspace to get a tall glass of diversity. "What I like about this place," says Maddox, who was about to do a "one-time deal" called Nerf Nugget, "is that if you've got a good idea, Jen will book it." Artisans and artists with items appropriate for the gift side of Deck the Halls may apply to SRAC to place their work on consignment during the holiday art market. "We need more gift items in the under-$50 range," said Steve Ross. The most enticing aspect is SRAC policy on the vendor split: artists receive 70% of sales. 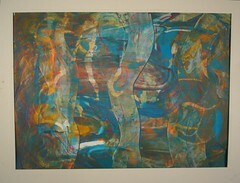 artspace at 673-6535 or SRAC at 673-6500. Says blues fan Lois McFarland, "El Chico in Madison Park (4300 Fern Ave) will be the location of the latest venue for AJ Cascio, Friday, November 2. 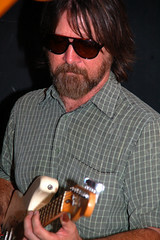 AJ and other members of the band Two Tone Blues will be performing from 7:00 til 10:00 - most likely on the Patio. Illustration by another fan of the blues, photographer Barbara Beaird. Shreveport Little Theatre’s box office will open November 6 for The Best Christmas Pageant Ever, says Gene Bozeman. Robert Darrow directs the Christmas comedy, which features the Red River Children's Choir and a pre-show lagniappe from members of the River Cities Jubilee Chorus. In the play a couple struggling to put on a church Christmas pageant is faced with casting the horrible Herdman kids—probably the most awful kids in the history of the world. In addition to the Red River Children’s Choir and members of the RiverCities Jubilee Chorus, the cast of 50 includes Sonia Lowe, Caroline Berlin, Julia Ash, Molly Shacklette, Mackenzie Allen, Tony Hobson, Laytin Spears, Stephanie Marsh, Barbara Holmes, Carolyn Bryant, Mary Green, and Eugene Crook. Shae Carson and Susan Green serve as stage managers. Others in the production crew include Diane Long, Emma Meeks, David White, Keith Bruce and Southern University Theatre students. 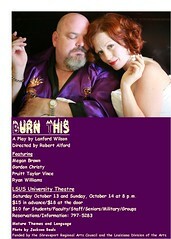 The comedy will be staged November 15, 16, 17 at 8 p.m. in the University Center Theater at LSUS campus. $15. for adults and $13. for students, seniors, and active military. SLT’s box office at 812 Margaret Place, noon to 4:00 pm: 424-4439. The Bon Voyage party for Buddy and the 'Birds will be Tues, Oct 30, 7 to 11 pm, at Horseshoe's Oak Creek Lounge, says Bruce Flett. They will be flying to Athens, Greece, Wednesday morning. Buddy Flett & the Bluebirds will be at the Half Note Club in Athens , Nov 2 - 8, and the Jazz Club in Istanbul, Turkey, Nov 9 & 10, with blues guitarist Hubert Sumlin. Slide guitarist Buddy will join Sumlin in Yonkers, NY, and NYC on Nov 16 & 17. "Jason Coffield will be filling in for Buddy while he's gone," says Bruce, who is staying in Shreveport. Jay Davis, former bassist for Rod Stewart, will be subbing for Bruce overseas. Drummer Cody Lowery will be in Athens and Istanbul, returning November 12. Bruce closed his weekly email with a historic note: "We will always remember the great Porter Waggoner from his Saturday TV show in the old days. That suit he wore was the most colorful thing on black & white televison. But Lester "Roadhog" Moran said it best, "Porter Waggoner and Dolly Parton ... that's a coupl'a Big Ones." The Indian Association of Shreveport's Diwali celebration will be held at Municipal Park Plaza, the small park on Texas Ave in downtown Shreveport, says Gopal Maramraj. Parking will be in the lots adjacent to the Municipal Auditorium. 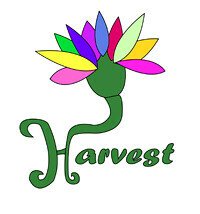 The dance program, supper and fireworks will take place on Sat, Nov 3rd, (rain date Nov 10). The Cultural Program will begin at 5:30; the food & fireworks at 6:30 pm. 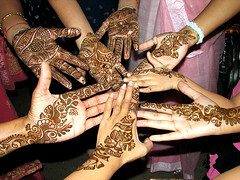 LSUS India Studies Program, and India Association Shreveport. 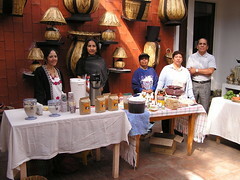 Food will be served by India Restaurant. $5, kids 12 & under. 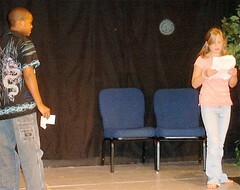 Open to young actors ages 10 - 15 years old. 12 students to the workshop. Mary Alfred Thoma is an actress, director, choreographer, teacher, writer and creator of two theater companies: The Sign Company and This Is Who I Am Summer Institute for Youth. See more of her credits on IMDB.com and by searching SptBlog. Streetcar service from the CBD to Napoleon Ave from 5:30 am til midnight will begin Nov 10, says New Orleans Regional Transit Authority officials. 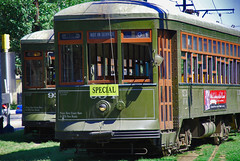 Pre-Katrina, the line popular with Uptown residents and tourists operated 24 hours a day. The RTA says after the entire line is up and running, perhaps in the spring of 2008, the operating hours may be adjusted. The return of service to about 3 miles of the 6.5-mile streetcar line means an end to paying parking fees for some Uptown residents who work in the Central Business District. And it is the latest victory in the authority's struggle to rebuild after Hurricane Katrina's high winds destroyed the overhead power system for the Saint Charles line and floodwaters from broken levees damaged the candy-apple red streetcars that graced Canal Street. "After much discussion and contemplation, says the late Willard Cooper's daughter, Arden brink, "Hans, Mom, and I have decided to have a memorial service for Daddy in Shreveport in the spring. We'd originally intended to hold a service within this first couple of months after his passing, but we've found ourselves wanting to wait until spring for several reasons. Daddy always loved spring in Shreveport, so right there it seems like the right time. We have a few people who couldn't come until then and wanted to be there. We want to put together a slide show CD celebrating his life and wanted to give people time to get pictures together and then create the show. And, finally, there's some discussion about having a final show of his work and that is taking some time to contemplate. Your many loving thoughts, wonderful memories, and kind words have meant so much to us over these past two months. We've been very touched to be reminded of how much he was loved. We will continue to keep you posted on when the service will be so that you can plan. And we look forward to spending some time in Shreveport in the spring to hopefully see many of you and enjoy celebrating a life that meant so much to so many." See Centenary College's remembrance collection on Cooper. 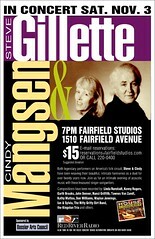 "Check out our next performing team: Steve Gillette & wife, Cindy Mangsen. This couple has been on the circuit for a long time now," says Candy Peavy. "You know they've gotta be good if they can make a living writing & performing music for any amount of time. audience. You are sure to be charmed by their charm." Sat. Nov. 3 at 7 pm. More arts and crafts booths, audience participation and varied food is the promise at the fourth annual Highland Jazz & Blues Festival, says Dorothy McDonald. The eleven-band event will be presented Sat, Nov 17, at Columbia Park. Drums will pound from noon until 6 p.m. Admission is free. The festival will be led off by the Red & Black second line brass band from New Orleans, says Highland Area Partnership chair Charles Gerard. The Red and Black will parade through the park and perform on the festival’s Pavillion Stage, accompanied by members of Grambling’s Zillionaires. Scheduled acts also include The Bluebirds, A.J. Cascio & the Two-Tone Blues Band, Dan Sanchez & the Kings of Pleasure, Professor Porkchop aka Chris McCaa, Dorothy Prime & the Bluesjumpers, the Saxy Guys, Pocket Change and more. Barbecue, pizza, Cajun, Caribbean, and Indian cuisine will be consumed. Readings of his work with images by Harvey Bialy. 9 pm - Polis is This! Charles Olson & The Persistence of Place. Documentary by Henry Ferrini - Louisiana film premier. 7 pm - Group Reading - Local popes celebrate the Beat Writers, including Joanna Ballard, Stanton Dossett, Laura Flett, Noma Fowler, Michael Harold, Sara Hebert, Bill Lavender, Kevin Meaux, Uriah Oxford, Michael Parker, Steve Parker, Steven Soffer, Michael Steinberg, Robert Trudeau. Film insert by Landry Debussy. Two films, one featuring Kerouac, the other about him. *The film and video of Robert Frank distributed by The Museum of Fine Arts, Houston. Info about the films. Minicine sliding download: $5 donation to free. Food, music, art and dance. Livin' la vida loca, yes? Shreveport Regional Arts Council has created a street scene for Saturday on Texas Ave near First Methodist featuring traditional Dia de los Muertos food, a farmer's market, a Guacamole Truck, Mexican ghost stories, and a professional Salsa dancing exhibition and competition, says Sandra McWherter. Says the gracious Jayne Lanza, direct from her restaurant on the shores of Cross Lake, "This weekend, I have The Stolen Sweets,performing. They are a fabulous 1920's - 1930's swing jazz band from Portland, Oregon. 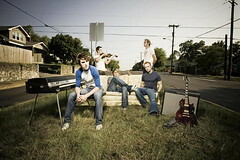 They will be appearing both Friday and Saturday night at 8:00 p.m. Opening on Friday, is Steve Howell from Marshall, Texas. A great guitarist. On Saturday, my daughter, Missoni Lanza, will be opening along with Brad Goodwin." 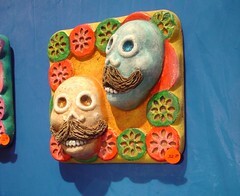 SRAC's Dia De Los Muertos exhibition will close at Artspace the day after Dia in Mexico. The actual day of Dia de los Muertos is All Souls Day, which is Fri, Nov 2. This weekend the Fall Fiesta: El Mercado will be from noon to 10 p.m. It's on Sat, Oct 27. The event is free. 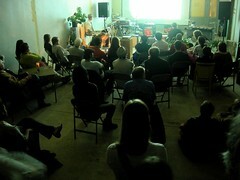 Artspace closing ceremonies will be Sat, Nov 3. 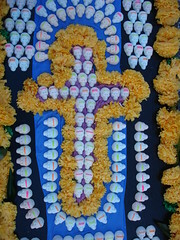 Ofrendas-making will be led by artist in residence Mary Jane Garza, of Austin, Texas, says Stacie Leng. From 6:00 pm - 8:00 pm Garza, known as Queen of Dia Culture, will offer a family-minded, free workshop: How to Make an Ofrenda. The Artspace exhibition is free and open from 10 a.m. to 6 p.m. Tuesday through Saturday. Please see an earlier, detailed post on el Mercado. 3 p.m. Sunday at the Anderson Auditorium in the Hurley School of Music at Centenary College, says Laura Crawford. 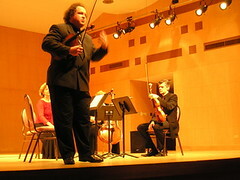 The concert is free and will feature concertos by Antonio Vivaldi. Theresa Zale Bridges will perform "Concerto in d minor" for oboe. Laura Crawford and Dan Santelices will perform a two-violin concerto. Sally Horak, Ruth Drummond and Gay Grosz will perform a piece by Jean-Philippe Rameau. 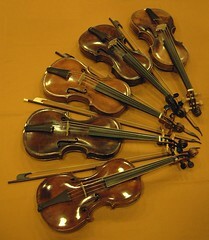 The show will end with "Quintet in C Major" by Johann Christian Bach. 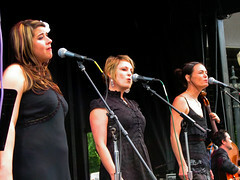 Additional musicians performing include Gary Bruns, Samara Humbert, Adrienne Gabriel and Donald Smith. Anderson Auditorium is a smashing room for chamber music. Highly recommended venue and musicians. Philosophy Talk, the show that questions everything except your intelligence, will visit Centenary College on Sat, Oct 27, says Jon Schleuss. Saturday from 5 - 6:30 pm, Stanford University philosophers Ken Taylor and John Perry will tape their show in Anderson Auditorium. They'll be exploring the concept of work with their guest, Al Gini. The session is open to the public and free. Or you can call-in your questions via (415) 841-4134. At noon on Sun, Oct 27, Taylor and Perry will broadcast a show from the KSCL studio, 91.3 FM. Before their show, they'll discuss philosophy, their effort to bring philosophy to the airwaves, and their take on work. KSCL broadcasts Philosophy Talk to at 10 am on Sundays and Wednesdays. Shreveport Opera returns to Riverview Theater, says Eric Dillner, with a sanguinary Broadway piece by Stephen Sondheim: Sweeney Todd, Demon Barber of Fleet Street. It is the opening of the 59th season of Shreveport Opera. In a rehearsal last night the set exploded with colorful projections though the cast portrayed life on the down and out in London. 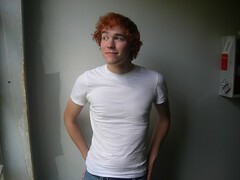 Recently the cast and production were profiled by Times writer Alex Kent. 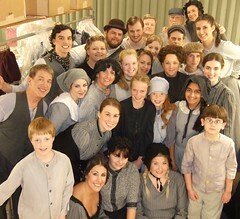 See more photos backstage with Shreveport Opera at ShreveportFaces. Tricks & Treats Night is a family celebration of spooky science and fun, says Eric Gipson at Sciport. One parent per child is free. Spooky River Cruise fee $10 per person: 120 total spots; RSVP. A still from "In the Shadow of the Moon"
Robinson Film Center continues to cherry-pick the ripe releases, the ones you can see only in the bigger markets. Next up, says the affable Christopher Jay, is "the Sundance Film Festival Audience Award-winning documentary In the Shadow of the Moon. It will be screened one night only on Thurs, Nov 1, 7:00 PM at the Louisiana Boardwalk Regal Cinemas." As you may have read, it's the story of the early days of American space exploration; it incorporates archival footage from the 1960’s and 1970’s as well as interviews with the astronauts. Tickets in advance: (318) 424-9090. "After the screening," says Jay, "we have an optional q-&-a session with local people who have unique insight into the topic of space exploration. We’ll be joined by Greg Andrews, Head Astronomer of Sci-Port, Drew Sidaris, former ABC live television staff who worked alongside Buzz Aldrin to bring all of the Columbia launches of the 1980’s to American homes, and more." Jay: "The film is rated PG. I caught it while in Denver recently, and loved it. The reason we’ve programmed this film is in part because it is a great film for people of all ages, something that we haven’t really been able to bring yet." Ghouls' Night Out 07, aka The Amazing Pumpkin Race, is on, says the Philadelphia Center's Ken Beatty. "You asked for it, so here goes. Your first tricky clue will be handed out at 7pm sharp on Sat, Oct 27, in the Philadelphia Center lobby. undisclosed location to see who is the winner." Entry fee: $20 per carload of your smartest friends. Prize: Bragging rights and a $50 treat. Award ceremony includes spooky libations and costume contest. Race reservations and questions today at 318-222-6633 ext 25 and as always: No hints; don’t even ask! Red River Radio Network concluded its 12-day fall fundraiser by meeting - and exceeding - a goal of $200,000. The final tally was $201,265. “With an annual budget that exceeds $1,000,000, it was vital that we raise at least $200,000 during this drive and thanks to our loyal listeners who pledged their financial support, we exceeded that goal,” said general manager Kermit Poling. Almost 450 new members pledged for the first time, while just over 1, 150 listener-members renewed their financial support. A final-day tally of over $41,500 was the second largest amount pledged in a single day in the network’s 23-year history. Red River Radio’s listener-members provide the largest source of the network’s income, about sixty percent. Other sources include business underwriters, foundations and grants, the Corporation for Public Broadcasting and other lesser sources. The Red River Radio Network provides news, information and entertainment to a large geographical area, broadcasting as KDAQ at 89.9 FM in Shreveport, KLSA at 90.7 FM in Alexandria, KLDN at 88.9 FM in Lufkin, KBSA at 90.9 FM in El Dorado, and on the Lincoln Parish translator at Grambling State University at 90.7 FM. "Please join the artspace Exhibition Committee in congratulating the artists whose works have been accepted for Deck The Halls 2007," says Stacie Leng at Shreveport Regional Arts Council. Exhibit Committee chair Steve Ross added, "We had a huge turnout and the art was juried very strenuously. To the artists: thank you for your participation!" See the SRAC calendar for Artspace hours and additional events. C.E. 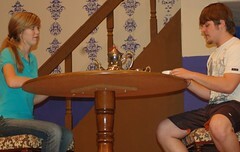 Byrd's Drama Club presents a Victorian Thriller called Gaslight this week, says director Ryan Williams. A Broadway hit first produced in London, Gaslight tells the story of the Manninghams. When the curtain rises, all appears to be peaceful. It is soon apparent that Mr. Manningham, a suavely sinister and handsome man, is slowly torturing his gentle, devoted wife Bella, into insanity - under the guise of kindness. Performances are Wed, Fri, and Sat, Oct 24, 26, 27, at 7:00 PM in the Byrd Auditorium at 3201 Line Avenue. Tickets are $5.00 and are available at the door. Please call Ryan Williams at Byrd (318.869.2567) for additional information. Description: "We got a strong group together, brainstormed for days, and came up with some of the most bizarre imagery we could think of and implemented it into a film that comments on many different aspects of our society. We painstakingly worked all night on costumes, make-shift sets, and final ideas. Setting out with our Panasonic DVX100's and loads of other equipment, we labored all day in the hot sun. Our actors were superb and were patient beyond belief while we worked out the various kinks on set. Editing through the night on our Mac G5's with the latest version of Avid Express Pro loaded on them and brand new DV/DVD decks, we at last saw the end of the journey." See an earlier post on the Perennial Media entry, under the aegis of Bossier Parish Community College; it's entitled Days of Winter. To vote upon the 3-minute video entries you're going to have to register for the Apple Insomnia Film Fest site; that took me maybe one minute. Matt Hazelton, road vapor still enveloping his head after the Dirtfoot drive from Texas, said, "We made it. We were voted into Voodoo Fest." 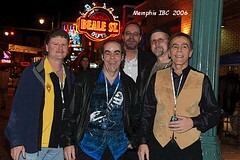 Fans will find the Shreveport sextet on the Voodoo Fest schedule on Sat, Oct 27. The event, held in New Orleans' City Park, programs some of the world's best known rockers - Rage Against the Machine, Smashing Pumpkins, Black Crowes, Wilco - against stages with some of Louisiana's best known jazz and funk - Soul Rebels, Hot 8 Brass, Lil Band of Gold, Marc Broussard, Quintron and Miss Pussycat. More auspicious news from Hazelton and Dirtfoot: "We'll be opening for the Asylum Street Spankers on our next trip to Austin. They have a huge following." And, in a sign o' the times, the Asylum Street Spankers sound a lot like their acoustic cousins from Shreveport. Recently there's more than droll coverage of Hollywood schlock at Louisiana Movies, Alex Kent's blog (see links) at The Times. Last week he blogged from the New Orleans Film Fest and focused on the documentaries. In one digest Kent wrote about director Bertrand Tavernier, who recently filmed “In the Electric Mist” in New Iberia and St. Martinville. Documentary filmmaker Jonathan Neil Schneider's "Mr. Schneider Goes to Washington, "a send-up of campaign financing, lobbyists, and political influence," won plaudits from the Times reporter. Filmmakers Vince Morelli and Jason Berry presented a documentary called "Left Behind: The Story of the New Orleans Public Schools." Kent calls it "stellar" and explains, "The investigative work charts the lives of three students during a two-year period. They all graduate and pass the LEAP test, but not without some serious struggles. 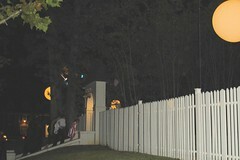 One student in particular was shot five times and passed the LEAP on his fifth and final time." Vince Vaughn and Peter Billingsley have a new concert documentary, "Vince Vaughn's Wild West Comedy Tour: 30 Cities in 30 Days - Hollywood to the Heartland." 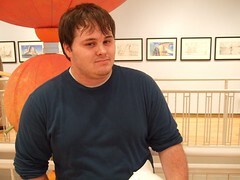 Kent says, "The documentary is long on both title and laughs." He also chronicled the adventures of Louisiana documentarians Allison Bohl and Connie Castille, whose award-winning film is "I Always Do My Collars First." Of his team's entry in the Insomnia Film Fest, Chris Lyon says, "We have been working hard on this one and it's a big improvement over last year's entry. After almost 22 hours of non-stop production, we finally completed Days of Winter, our entry for the 2007 Apple Insomnia Film Festival. Voting will open to the public on the Apple website this coming Friday, October 19th and will stay open until the end of the day November 9th." More information on Days of Winter can be found at the Perennial Media site. Artist Dennis O Bryant wears 7 league boots, and you can see what I'm talking about at his blog. There's the Texan tromping from fire and kiln to the paint pots in his studio to the woods and streets, wielding his camera and point of view. He documents the process. And puts the record of his trek on line. 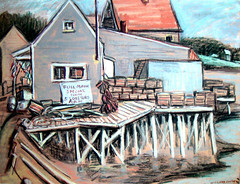 It all points viewers to the galleries of his work and info such as exhibits and sales. 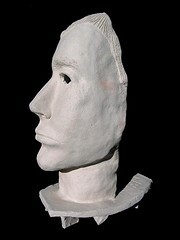 Not all artists ought to follow his practice. But for many artists it makes sense. And for art-minded readers it's entertaining and instructive. Singer-songwriter Sara Wasserman will be accompanied by her father, Grammy-winning bassist Rob Wasserman, in a show at Jayne Marie, says Bruce Flett. The gig is Sat, Oct 20. The Bluebirds open at 7 pm. Sara's originals from her debut CD of acoustic soul and blues and the standards are to be the theme of the show. Her upcoming release features collaborations with Aaron Neville, Lou Reed, Soulive, and Christian McBride, among others. Father and daughter will be accompanied by another LA big boy: pianist-producer Randy Emata. "Heading to NYC for the BIG CMJ music marathon, where names from the music industry meet to discuss the current and future happenings in music," says KSCL's John Schleuss. "I hope to use this space to post blogs from each day of the event. That way you guys can get an inside peek at what we'll be seeing from inside NYC." Schleuss interviewed Conchita McElwee this week on her Dia de Los Muertos show coming up Nov 2 at Jackrabbit Lounge (see links). New staff member Nadine Kaskas is producing political interviews. Also, Tyler Davis is using some of his air time to play radio documentaries, such as one I heard on Sly Stone. All in all, it's a humming reed in the wind. Never know what kind of music you'll get from the student dj's. But last week I found 2 of them airing the entire Radiohead album. A fair amount of it lies upon their blog, which I reach via kscl.fm. The Fall Fiesta El Mercado will cha-cha on Texas St from noon until 10 pm on Sat, Oct 27 - and it's free, says Bonne Summers. "We'll have food, music, dancing, salsa dance competition and exhibition, arts and crafts galore - and a fall farmer's market featuring plants, pumpkins, Indian corn, squash, and many more items that people can purchase." There will also be Spanish Speaking Survival Lessons, Ofrenda Storytelling, and Mexican Ghost Stories. "And," adds Summers, "best of all - the Holy Guacamole Truck and Roaming Display will be on site featuring giant 3D avacados and tastings of guacamole - this is much like the beloved Oscar Weiner Mobile but better!" We found an article at smallbiz.com that says, "Fresherized Foods—a Forth Worth, Texas, company that packages and distributes Wholly Guacamole, a line of various guacamole flavors to retail stores across the US — recently embarked on a year-long mobile marketing blitz. The big idea, says Jay Alley, is to ease customers' concerns that the dip is fattening and "gooey." Knowing that the company needed to preach guacamole’s benefits while also offering people a taste, Alley decided to take the show on the road and retained the services of marketing-consulting firm Latimark of Irving, Texas. They hitched a giant avocado to a truck wrapped in yellow vinyl (and adorned with campaign slogans like "Friends Don't Let Friends Double Dip") and have been giving away T-shirts and free samples to crowds in cities from Dallas to New York." Says Michael Stevens of the Peekers: "Help The Peekers get to NYC for their showcase at the annual College Music Journal Festival. Their hearts were broken last week when their "brand new" school bus broke." Canceling shows to and from the festival, these players remain focused on making their time slot at the Park the Van showcase Fri, Oct 19.
unreleased EP from Park the Van records entitled "Cheer 4." gas, plane tickets and cab fare. The Peekers are with Philly-based independent record label Park the Van records. The PTV showcase has been highly anticipated by many independent music distribution companies, magazines and networks. Michael Parker, bookmaven, continues work on the Kerouac reading scheduled for Sat, November 3, at minicine. The reading has been titled "Dharma Bums, Angelheaded Hipsters and Black Mountaineers," and is scheduled for 7:00 at 846 Texas St. in downtown Shreveport, says Parker. He's found plenty of participants but little ethnic texture amongst the readers and writers. So Parker begs, "If you know folks who would like to participate, particularly more women and non-white folks, I would love to see more Shreveport diversity represented." Reach the organizer at mpbookfreak@hotmail.com. Monty Brown, the folksinger and filmmaker, got his master's degree in history at Northwestern State University, Natchitoches. 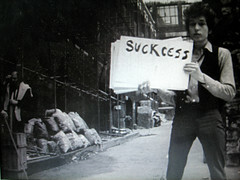 There he fell under the spell of the yet-to-be-researched material on North Louisiana's folk singers. He says, "I did a Master's thesis at NSU on Leadbelly. I also spent many hours interviewing Jesse Thomas and others when I did the Louisiana Folk Music program. So we've been sorting through the information and decided to log it onto the web." 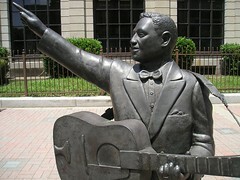 The result is a Lead Belly-based blog that reflects a broader view of this region' s folk musicians. Brown adds, "I have a whole studio album of music, as yet unreleased, on Jesse and Peaches, which may be their only recordings. We did it at Nightwing Studios back in the day and hope to release a CD before too long." The blog is called Mister Huddie. There's an additional link to Monty and Marsha Brown's work on this blog's sidebar. With a change in the weather comes Port City reggae night, announces Christian Simeon of Outlaw Nation. Groove to it Tues night, Oct 16, 9 pm, at Full Moon Bistreaux. Danny Wilder, Ted Lindsay and many of the original Tommy’s Place Blues Jam musicians have organized a benefit for the Renzi Education and Art Center, Shreveport. The event will be held Saturday, Oct 20, from 6 p.m. until midnight at Lee’s Liquid Assets and Tiki Bar and Grill, 639 East Kings. Cover charge is a donation of $5.00 or more, says Amy Bryant. Monies raised will go to support the Renzi Center. This free academic and art-based after school program located in the heart of Highland is dedicated to nurturing the creativity, self-esteem, and intellectual pursuit of youths in grades 1st through 12th. Performing on the electric stage are Buddy Flett, Joe Nadeau, Ted Lindsay, Jerry Beach, Danny Wilder, Jason Coffield, John Compton, Keith Free, A.J. 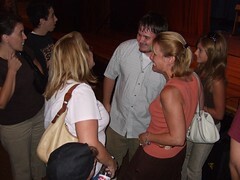 Cascio, Kevin Smith and many others. 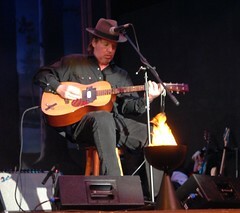 Playing on the acoustic stage are Stanton Dossett, Julian Dossett, Clyde Hargrove, III and many moors. 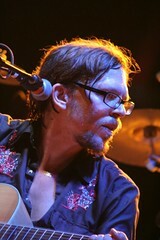 Photo of Wilder by Barbara Beaird. "Here's your chance to meet with Mayor Glover and talk with him one on one about how you think the city is doing, where you think his administration needs to focus, learn about his goals and priorities, etc.," says young political staffer Jeff Everson. 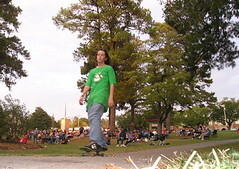 "Feel free to Rsvp to my myspace page, or 318-347-2554, or to eversonjeff@hotmail.com. The response has been great so far, and I'm looking forward to seeing everyone there!" That's the Stoner Boat Ramp Cafe, Tues, Oct 16, 5:30 pm. for students, $10 for all; additional donations are appreciated. 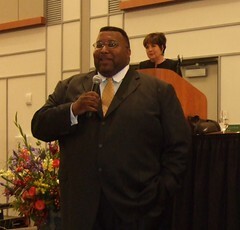 Matthew Campbell, for whom the benefit is planned, is the son of long-time Centenary conference and facilities coordinator Francine Campbell. The Centenary community has rallied around to support the Campbell family with their mounting financial needs, says Jennifer Strange. The campus has opened a donation account at Capital One Bank in Matthew's name and is holding several fundraisers, including a jeans day and this benefit concert, sponsored by the student ecumenical worship group Stepping Stones. Artscare, billed as a devilish fundraiser for Artspace, draws a mix of midnight boa types as well as the proud-of-their-cleavage and legs sorts of lassies and laddies. Then there are their minions and the gawkers. In short, expect a healthy Halloween at Artspace. Artscare is Fri, Oct 26. It opens at 8 pm. You may ditch your heels at the witching hour, say the chairs, who are Donna Poimbeauf and Karen Courtman. Tariff is $50 per capita. Silent Auction, featuring skeletons from the attic, both art and artifacts. 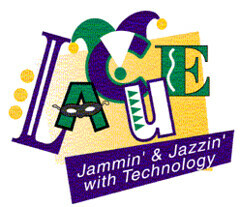 Conference, Nov 28 – 30, in Baton Rouge. Site is the Baton Rouge River Center. Give your teachers a scholarship, if needed. In most cases the skills and savvy picked up at LaCUE transfers directly to the lives of children. An Artists’ Market Place will take place in Texas Street outside of artspace on Sat, Oct 27, says SRAC's Pam Atchison. 2. The “Dias” celebration day on Sat, Oct 27 in Texas Street. Please suggest the price of the works. 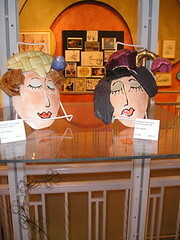 SRAC sales policy is that the artist receives 70% of the sale, SRAC receives 30%. SRAC and the artist discuss optimal pricing for better sales. 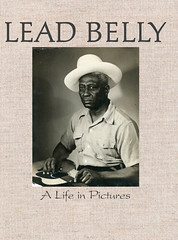 Lead Belly: A Life in Pictures is a trove of rare, unpublished photographs, news clippings, concert programs, personal correspondence (including letters from Woody Guthrie), record albums, awards and other memorabilia retrieved recently from a basement trunk in New York, says the German publishing company Steidl. It will be published in November. one from a local paper with a woman with a flowery church lady hat standing to the left. 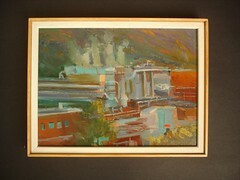 Want something evocative of the deep south. Also, do you have any pics of celebrities at gravesite? And maybe one of the old Shiloh Baptist Church before it was enlarged?" If you can help with photos or threads that might lead to photos, please email me at trudeau@earthlink.net (as above) or Reynolds, a Lead Belly scholar and photographer of Huddie in NYC, at mistareynolds@earthlink.net. Tiny Robinson, co-editor, is a niece of Lead's who was part of his life in NYC. She is founder of the Lead Belly Foundation. Originally uploaded by David B. The Pioneer Heritage Center on the campus of LSUS has the annual Pioneer Day on Sat, Oct 13, from 10:00 a.m. to 4:00 p.m. The cost is $2. Children under age five are free. All seven historic buildings will be open for viewing, says LSUS. Pioneer Day began in 1996 as an independent study project to educate and inform the community about the Pioneer Heritage Center. Marty Young, director of the Center at marty.young@lsus.edu. Last night on kscl.fm, 91.3, the young dj's were all playing In Rainbows, the Radiohead album which is the coolest daisy growing on the planet. Radiohead made history Wednesday when they issued their seventh album as a "pay what you think it's worth" digital download. First of all, the album is a solid, fun piece of work. Radiohead fans will be happy, I think, and new listeners will be stimulated. Secondly, it reminds the world that artists sometimes do more than work their artful ouevre. Bucking the fusty mainstream is something you can try when you're at the bottom or the top. The fellows in Radiohead have sold some 20 million albums worldwide and are bloody rich. On the other hand, the album is meticulously crafted and is the product of 2 years in studios. Only musicians can begin to imagine the amount of work represented in the tracks of In Rainbows. There is a controversy over the sonic quality of the download. But what I heard on Kscl last night seemed quite listenable. "Imagine This" grants are being considered by the SRAC Artist Roster each month, says Carlos Colon. http://srac.pixelfusionhosting.com and click on "Resources" and then, under the drop-down menu, "Forms." wanted to remind all to get in touch. Applications are due Oct 16. 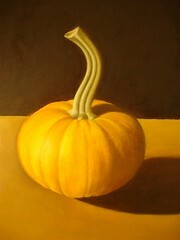 Please contact me if you have any questions at autumn@shrevearts.org. I look forward to hearing from you and seeing your work!" Pam Atchison adds, "I wanted to make sure all writers, poets and musicians are aware of this opportunity. Books, CDs, etc. are eligible for Deck the Halls." Movie stars hit the stage with top local players in Burn This. Please see the sptBlog review posted last weekend. Run time with intermission about 2 hours, 45 minutes. Chronic Soul was featured on The CBS Early Show this past summer, says Rene Foley. And the trio is "fresh off of their appearance at The Red River Revel last week. " Sat, Oct 13, they will sing their old school and neo-soul material at Jayne Marie (please see link). Show time is 8 pm to 11 pm. Several of Shreveport-Bossier City’s most talented local filmmakers will compete in the nationwide Insomnia 24 Hour Film Festival this Sat, Oct 13. The filmmakers are required to write, shoot and edit a film within the 24-hour timeline, says Chris Lyon. One Shreveport-based team will be filmmakers Chris Lyon, Luke Lee, Keith Shively and Daniel Lachman. 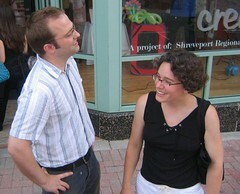 They recently produced the well-reviewed film Plummet (www.plummet-movie.com), which debuted in Shreveport on July 20. The same team placed 8th of almost 300 entries in last year's festival, says Lyon. 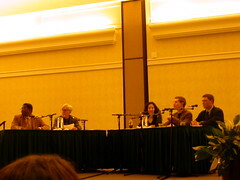 Due to the nature of the festival, the filmmakers cannot write the script until the contest begins. This means that a cast cannot be chosen until that day. The filmmakers are looking for talent who would like to be included on a standby list for Sat, Oct 13. Once the script is written, the filmmakers will chose a cast based on the look of each character that they wish to be portrayed as well as the actor's credentials. Actors and actresses that wish to be a part of this film festival should submit their résumés and head shots to Perennial Media by emailing insomnia@perennialmedia.com.